The New York Giants have officially signed unrestricted free agents wide receiver Cody Latimer (Denver Broncos) and cornerback B.W. Webb (cut by the Cleveland Browns last week). The 25-year old, 6’2”, 215-pound Latimer was originally drafted in the 2nd round of the 2014 NFL Draft by the Broncos. 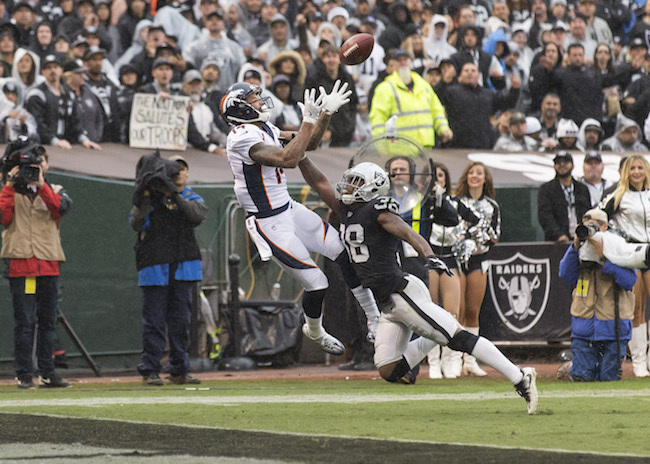 In four seasons with the Broncos, Latimer played in 45 regular-season games with three starts. He has 35 career receptions for 445 yards and three touchdowns. Despite missing five games due to injury, 2017 was Latimer’s most productive season as he caught 19 passes for 287 yards and two touchdowns. He’s a big receiver who will fight for the football. While Latimer never lived up to expectations as a receiver in Denver, he was an excellent special teams player (gunner) for the Broncos. He also has some experience returning kickoffs. The 27-year old, 5’11”, 190-pound Webb was originally drafted in the 4th round of the 2013 NFL Draft by the Dallas Cowboys. Webb has spent time with the Cowboys (2013), Steelers (2014), Titans (2015), Saints (2016), Bears (2017), and Browns (2017). Webb has played 49 regular-season games with 10 starts – eight of which were with the Saints in 2016. Webb is a very good athlete and plays with an attitude, but he has not been able to stick with a club since entering the league. The New York Giants have officially re-signed unrestricted free agent defensive end Kerry Wynn to a 1-year deal. Wynn was originally signed as an undrafted rookie free agent by the Giants after the 2014 NFL Draft. He has played in 49 regular-season games, with 10 starts. Wynn played in 15 games with three starts in 2017 and finished the season with just 19 tackles and one sack. For a complete listing of free agent comings and goings, see our New York Giants 2018 Free Agency Scorecard. Multiple sources are reporting that the New York Giants are expected to sign unrestricted free agent defensive end Josh Mauro (Arizona Cardinals). The 27-year old, 6’6”, 282-pound, English-born Mauro was originally signed as an undrafted rookie free agent by the Pittsburgh Steelers after the 2014 NFL Draft. He did not make the team, but was signed by the Cardinals after he was cut. The Cardinals cut him last week. In four seasons with the Cardinals, Mauro played in 47 regular-season games with 26 starts, 20 of which came in the last two years. In 2017, Mauro started seven games and finished the season with 22 tackles and one sack. Mauro is a hard-working run player who does not get much heat on the quarterback (only two career sacks). The Houston Chronicle is reporting that the New York Giants and New England Patriots have expressed interest in unrestricted free agent wide receiver/special teamer Marcus Easley. The 30-year old, 6’2”, 217-pound Easley was originally drafted in the 4th round of the 2010 NFL Draft by the Buffalo Bills. In his first five seasons with the Bills, Easley played in 42 games with no starts. He suffered a serious knee injury (dislocated knee cap and fractured knee) in December 2015. Easley did not play in 2016 and the Bills cut him in March 2017. Easley only has three career receptions and is known more for his special teams play.